Sauber looks set to continue its relationship with Ferrari when the new engine regulations come into effect in 2014, though team boss Monisha Kaltenborn has voiced concerns over any cost increase as a result of the new rules. 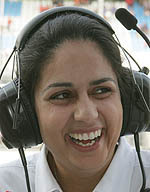 "It's a logical step for us to first go and talk with our current engine partner because we do have a long history together with them," said Kaltenborn, "but all is open because I don't think they know themselves about certain conditions." With significant changes expected as new technical regulations are introduced in 2014 teams have already begun work on their cars. However a number of details, including a final decision on the engine regulations, remain outstanding. A Technical Working Group was held between the German and Hungarian Grands Prix at which discussions surrounding those regulations took place, though all at the meeting have been tight lipped on any decisions that might have been agreed. "The agenda was prioritised around the 2014 regulations," Ross Brawn confirmed. "They had some important decisions to make for 2014 in order to enable people to continue work on the cars and not waste effort on things which wouldn't be allowed or had changed." One of the topics understood to have been discussed, and one which is key among Kaltenborn's concerns, is the affordability of whatever new power plants are eventually introduced. Stable regulations with severe restrictions on engine development have witnessed not only a comparatively even playing field in recent years but significant reductions in costs. Any change to such mature regulations could open a Pandora's Box, potentially driving up costs which would likely be passed on to any customers. "All customer teams have made it clear that the financial aspect is very important," said Kaltenborn. "We don't want to return to the times where you paid so much more than today for the engines. That would be the wrong move. "You have to find an equitable solution for customers and for the suppliers of the engines on what you can do on the pricing and development costs they have." Ferrari first supplied engines to the Swiss-based squad in 1997, when they were re-badged Petronas, and have supplied the team ever since with the exception of four years from 2006 when BMW propelled the Hinwil based squad.